Guest post by Mary Kate of The Music Bed. Next page…next page…face palm…head on keyboard. Does this sequence sounds familiar to you? You might be one of the thousands of filmmakers suffering from “I’m out of my mind trying to find a relevant song for my video..itis.” Fear not, your friends here at The Music Bed have taken the grunt work out of the search for quality tunes to fit your films. Music is an essential piece in the filmmaking process— this you know. However, what you may NOT know is that .99 cent little ditty you bought on iTunes does not ensure you the right to sync said-song with your video. Hmph. Forget your troubles and head over to a music licensing site that provides a curated library of legal music that suits you style. Now that you’re not having to duck your head and hide your videos from the artistic community in fear of being “found out” because of your illegal soundtrack–we invite you to step into the light and share freely with filmmakers and musicians. Let’s chat about post-production in terms of laying your new-found stylish audio. Now to find the perfect song– searching is made simple on themusicbed.com with filters by mood / genre / instrument / and even event. Ultimately, we understand that you aren’t making a video to feature the song, you want your song to compliment your video, right? Right. This is where your ear comes in! Musicality in filmmaking is necessary to produce captivating pieces that carry impact. What is the personality of my video and my client? The tempo and mood of your song should be in direct relationship to your content. Switching frames with the beat and and ducking vocals at strategic times are key. What am I trying to say? With thousands of lyrical and instrumental songs hand-picked for such an occasion, finding a track with lyrics or notes that speak directly to the emotion of your film raises the impact meter by about….1,000. You’re all set up! Now that you’ve gotten a taste of the musician compensating, film accommodating, relevant licensable music library…you’re ready to share freely with the rest of the world! 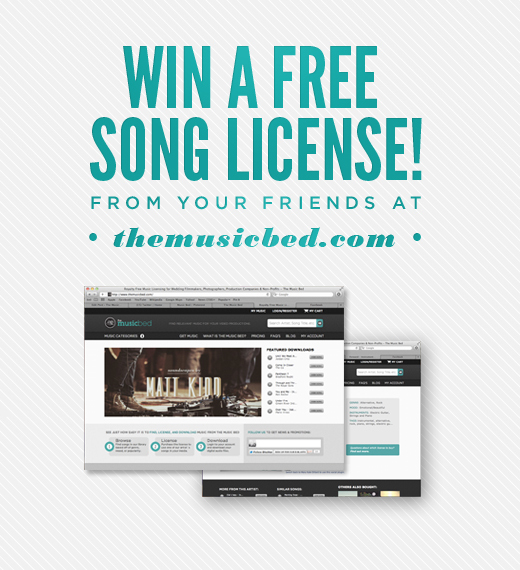 To kickstart your success, we’d like to give away a free song license! By clicking the link below, you’ll have the opportunity to ‘like’ The Music Bed on Facebook — by becoming a fan, you are then entered to win one free song license. The winner will be announced Friday the 17th at 7:00pm EST.